When we decided this Summer issue would focus on the topic of love, I worried about trying to squeeze such an uncontainable subject into a few dozen pages. It would be like trying to pack a year’s worth of outfits into an overnight bag. Is there any subject that inspires as much emotion, intrigue or investigation? Love is the deepest, most powerful expression of the human condition, knitting us together, regardless of legal, sexual, geographic, religious or other boundaries. Love conquers all. Love is universal. Still, there are some distinctly Brandeisian characteristics in the love stories in these pages, even if our collection of narratives is far from comprehensive. Take the dozens of tender, sometimes zany accounts from alumni who explain how they met their kindred spirit at Brandeis. In “Tales of Louie Love,” you’ll find the usual jitters, dashed hopes and awkward moments that define young love. But the moxie and inextinguishable wit — not to mention ingenuity — the romantically hopeful summoned in the pursuit of love is truly Brandeisian. Of course, love wouldn’t be love if it weren’t tested. Brandeisian love has backbone, especially in the face of adversity. As she recounts in her Turning Points essay, Gail Shister ’74 and her wife had to run a gauntlet of bias almost 30 years ago to become parents of one of the first “gaybies.” Her pioneering experience has since been followed by countless gay women and men who simply want to participate in one of life’s greatest pleasures (and burdens). A month after her 23rd birthday, Allie Morse ’10 (“Cancer and the Single Woman") was diagnosed with stage IV Hodgkin’s lymphoma. Soon after, her boyfriend split. Most people in her situation, fighting the side effects of chemo, would resign themselves to solitariness. Not Allie, whose true Brandeisian pluck helped her get on with her romantic life. 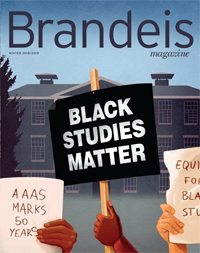 Any issue devoted to Brandeisian love wouldn’t be well-rounded without some kind of protest story. In this case, the protest took place 50 years ago, when students rebelled against the university administration’s determined efforts to control the undergraduate libido through rigid dorm rules known as parietals (“Rules of Engagement”). The students lost the battle but ultimately won the war — so perhaps all is fair in love and war. Philosopher Andreas Teuber has more to say on this subject in Perspective. If you recognize some part of yourself in the stories in this issue, give yourself — or the ones you love — a big hug. You’re part of a community that lives by loving. One content reminder about the Summer issue: To lower production costs without compromising the magazine's excellence, Class Notes will now be included in the Fall/Winter and Spring issues, but not in the Summer issue.